I've discovered a few new things to keep my flying skills sharp during these unflyable winter days. I saw the the Pico2 on the news a few days ago. Julie thought the miniature helicopter would make great gifts for some of our younger relatives. We promptly went online and ordered three of the toys. Within a few days the helicopters arrived, and I spared no time opening one to get a closer inspection of the pint sized crafts. 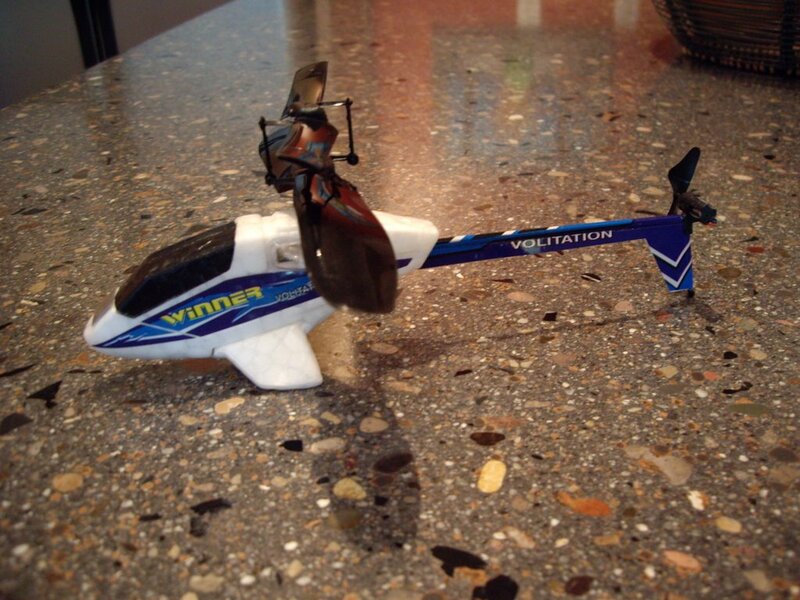 After all, the choppers should be tested before allowing the children to try them out. 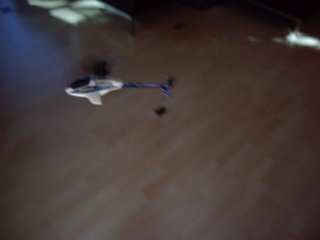 Here's a shot of the lil' chopper hovering just after take off. It's actually quite manuveable, and very stable in flight. Where am I? Any guesses? 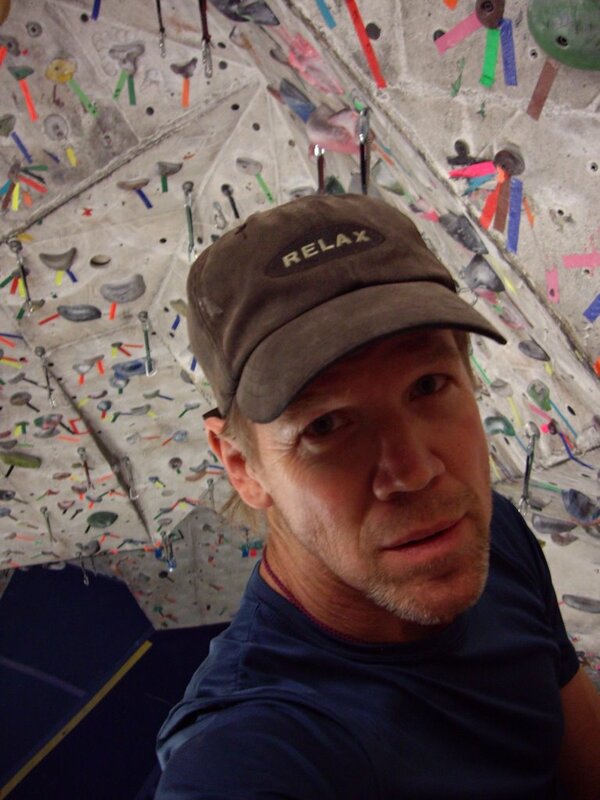 I am at Rockreation indoor climbing gym, around thirty feet off the gyms floor. Sunday nights i trade route setting duties for a membership. The day begins earlier than I care to start. Being Sunday I'm inclined to stay in bed a bit longer, but needless to say, I rendevous with Greg Billow at our usual meeting place at 7:30am and by 8:30 were setting up on the south side of the Point of the Mountain. No sooner do we get there, we hear the all to familiar and dreaded sound of rescue vehicles approaching launch. 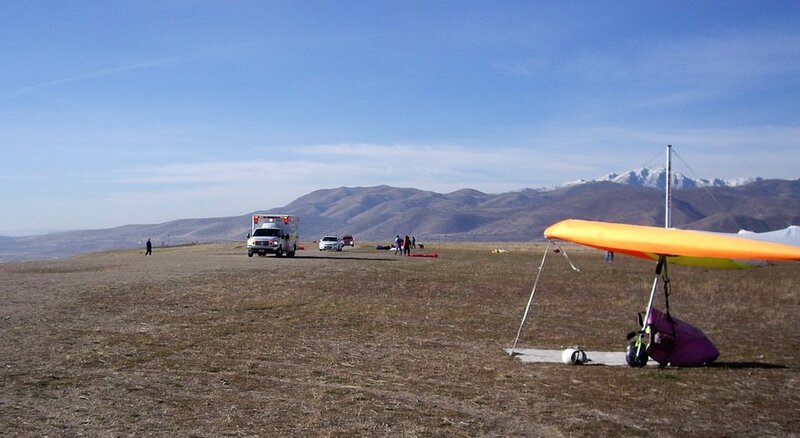 It appears that a paraglider was blown over and past launch sustaining serious back injuries. Cody showed up just a short time after Greg and I began setting up, but somehow he managed to get in the air before we did. 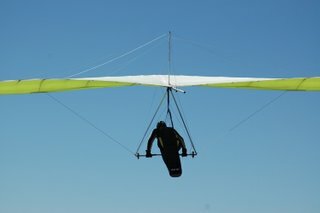 Because my camera batteries died early in the day, Cody was the hangglider pilot I captured on camera. We used an old t-shirt for a target and had fun practicing spot landings. All in all, it was a great day. There were at least nine hang glider pilots out, even Steve Rathbun showed up. 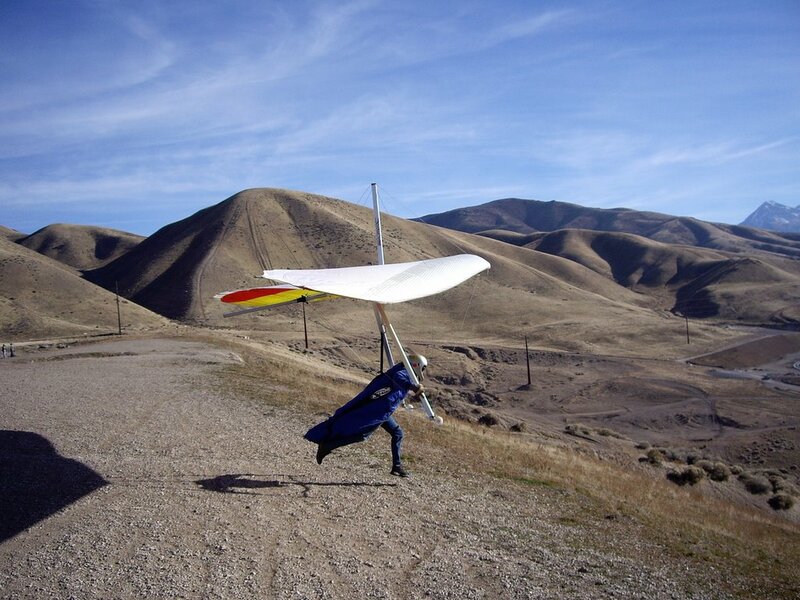 Steve set up his Talon and was able to do some ground handling in the wind. A great effort. Great to see Steve back. It has been a while since my first blog. A lot of flying with a little climbing mixed in, and quite a bit of work. Recently Julie, my wife and I, visited Southern Utah. 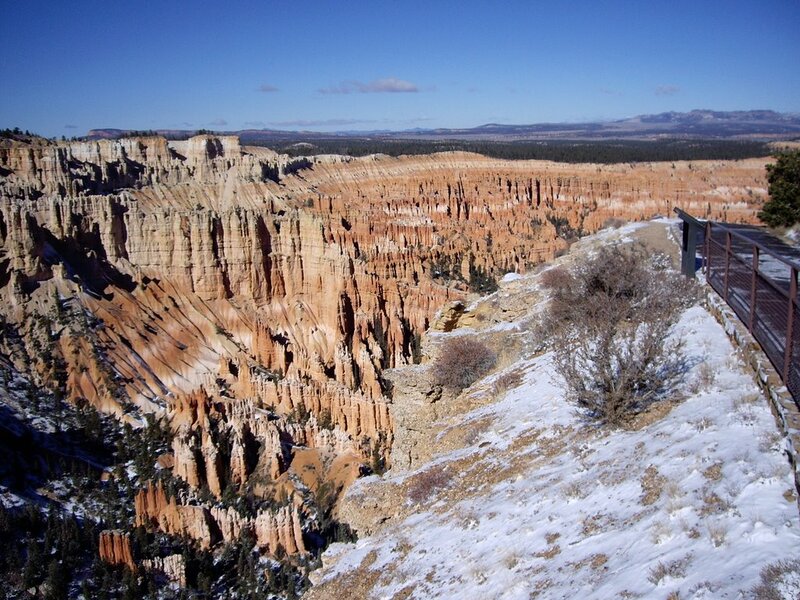 We had a great time hiking, and had a good stay at the local B&B in Escalante. Not to mention some of the best Mexican food I've had in a long time. Georgies is a little house converted to a restaurant, right on main street in Escalante. 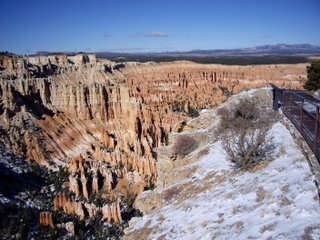 On the way back home we took a short detour and visited Bryce Canyon. It was pretty cold as the evening before a cold front moved through the area dropping a considerable amount of snow. An interesting Raven begging for handouts was hanging out at one of the turnouts at Bryce. 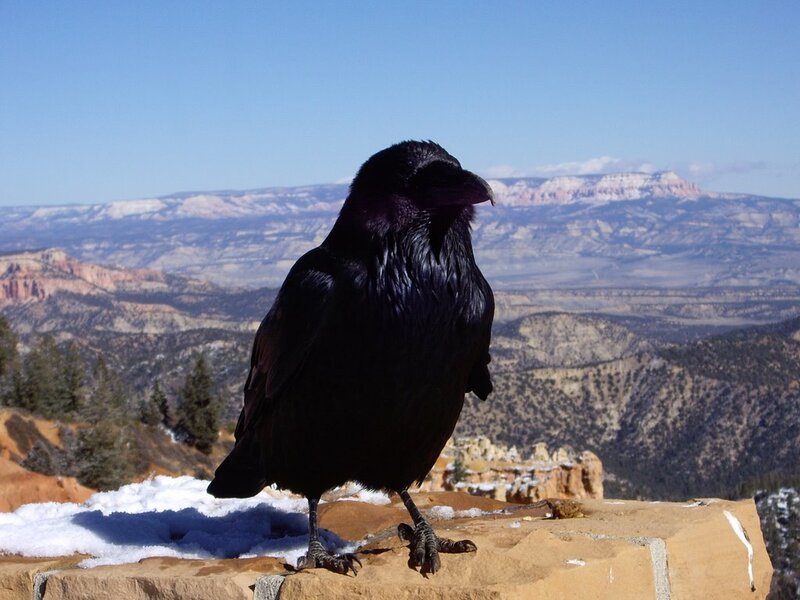 As I began tearing of a corner of a Power Bar for the raven, Julie was quick to inform me I was only going to further the birds dependency on human food and cause him to be more of a nuisence. Bad me, I fed him anyway. This summer has been one of the most anticipated seasons for flying that I can remember. I'm not sure what started it. Possibly the lack of flying during the winter and spring months. The main effort has been flying cross country, and though our small band of local hang glider pilots have put together quite a few trips, we've yet to break the all to illusive 100 mile barrier. There were a hand full of 20 and 30 mile flights, as well as a 60+ mile flight flown by Cody Dobson and myself. 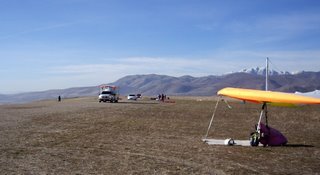 Cody flew from Heber, UT to just past Evanston WY for his 60+ miler and I had a 64 mile flight from Moore ID to Chelan, ID. 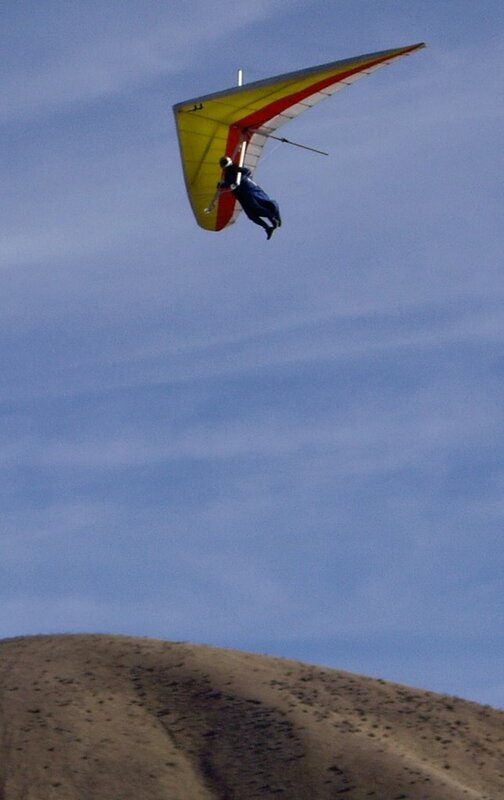 Greg billow has had some great flights from lakeview, OR as well as Utah sites, Heber and Inspo. As a sailplane pilot as well as hang glider pilot, I try to get out to Cedar Valley Airport and fly sailpanes on days when hang gliding isn't happening. 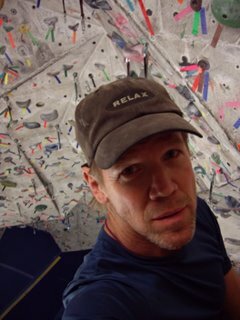 On Monday, August 8th I towed up behind Brett at around 3:30 pm, released at 1800 agl and climbed to 16,800 ft. After my climb I headed straight upwind on a southerly heading 15 miles and lost only 1000 ft.. I then flew back toward Commador Peak on the Okir Range and played in the lift. Flight time 2 hours. The summer is not over by any means, and I'm still hopeful for great XC days ahead.